I received a variety case of Dundee Craft Beer for my birthday. The only Dundee that I have had was the Honey Brown and it’s been a long time since I’ve had one of those. (Like 5 years or more) I did not know that they made any other craft beers so these next few reviews will be interesting as I sample my way through the case. I’m vacationing at my sister-in-law’s house in Front Royal VA. I’m cooling off inside after long hot day playing with the kids in the poor. 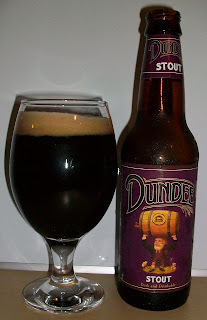 It’s late in the evening so I figured I would go for the Dundee Stout this time. I did not bring a pint/tumbler with me so I will be using a standard Cervoise glass. This will be the last of the Dundee Craft Beer Reviews. The beer pours a dark brown stout dark, totally opaque with no light getting through and a modest but creamy dark tan head. The nose is also modest for a stout but here are nice aromas of dark roasted malts with notes of dark fruit and chocolate. Well, I have to say that that first sip did not blow me away. Actually it was a bit of a let down. It’s not bad, it just does not have a lot going for it. The taste (or lack there of) starts out with a dark malt sweetness up front then an almost cleansing mouthfeel in the middle of the sip. There is a slight robustness that builds toward the back-end but seems to fade again by the time you get to the top of the swallow. This is a very easy drinking stout with an almost effortless swallow. 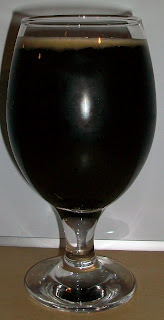 You really do not start to pick up stout like flavors until you get to the finish and that is light also. The finish has some dark roasted malt flavors with notes of dark fruit and maybe a touch of chocolate but once again these are very light flavors for a stout. There is little to no aftertaste. Typically there is a lingering roasted malt aftertaste with a stout that is not present here. This is a very easy drinking beer. And I think that’s my problem with it. It’s too easy drinking for a stout. Actually this is light bodied for a lot of porters. As this beer warms and opens up a little it is getting more robust. It is still a very light easy drinking stout just a little more robust. Well, I’m not sure how to rate this one it’s not a bad beer it is actually quite enjoyable. I was just expecting a more “stout-like” stout. This has the body and mouthfeel of a brown ale or light porter not a stout. But on the other hand this beer was probably made lighter so it would be more appealing for a wider drinking audience. Since this was a nice drinkable beer a C does not seem fair so I am going for a B- on this. It’s a nice drinkable sweet stout. It should be appealing to a wide beer drinking audience. I would rather it be a little hardier but all and all it was a good tasting beer.